Imagine living where no one speaks your language. Maybe dogs feel this way about us, because so often they send us messages that we just don’t get. During class we work on making communication a two way street. We explain what a doggy message looks like, what basic mannerisms mean and help you understand how to recognize your dog’s signals. If we pay attention, we discover that our dogs never stop teaching us. When your dog’s feedback is acknowledged and the lines of communication are open in both directions, your dog understands that they have a respected position in the pack, they learn how to learn and every new command gets easier to understand. With communication you can benefit from their many strengths, their wisdom and their often superior understanding of the environment. Dogs will smell the smoke first and tell you, they will see the toddler wander out the door and tell you, as long as you are listening. Understanding the messages that your dog sends with his or her body language, usually reveals a lot about the dog’s state of mind and helps to decide the right style of correction to use. A nervous dog needs a slower more reassuring approach while a stubborn dog needs a firmer voice and perhaps some gentle downward encouragement on the tush. The distracted dog might just need to hear their name firmly said to get their attention back to you. The dog with a hurt back is more problematic. If you understand your dog’s basic nature and body language and your dog is usually obedient to that command, you should immediately check for other issues starting with physical ones. It could be a leash wrapped around your dog’s leg, or a hurt back. If you have a stubborn dog it is often difficult not to assume “stubbornness” as the reason for disobedience. Understanding your dog and how to read them becomes so much more important with less amiable dogs. Possibly the most important information you can learn is to understand your dog’s basic nature, what personality traits they default to when stressed and how to read them. 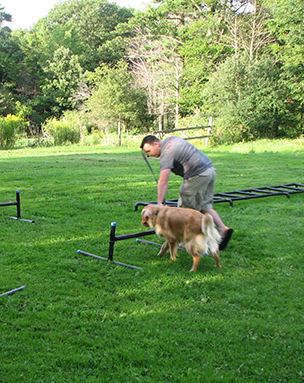 Your trainer will give you an assessment of your dog’s character and show you the best approaches for training. Dog and wolf pack behaviours have been extensively studied and are well understood. A strong social hierarchy is genetically encoded and is re-enforced within weeks of birth. As the pups interact with their mother and siblings their behavior receives and immediate and unequivocal response, either negative re-enforcement (a low growl) or positive re-enforcement (wagging tail, play bow , nuzzle). This style of interaction forms a canine’s life and ranking in the pack from the day it is born. It is a profound survival tool. 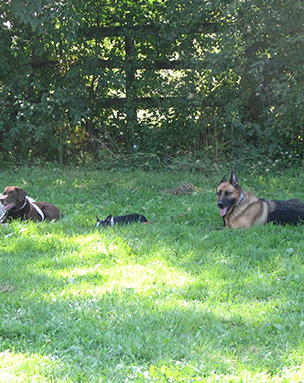 Social signals are often about pack safety and if orders are not respected and obeyed, dominant dogs will increase the intimidation level and finally resort to force. This is nature’s way of ensuring a coordinated pack effort for hunting, raising puppies and protection of the territory. Following pack rules avoids fights and/or being driven from the protection of the pack it is a about survival. Our training principles are built on these tried and true rules developed by mother nature and supported by proven techniques. 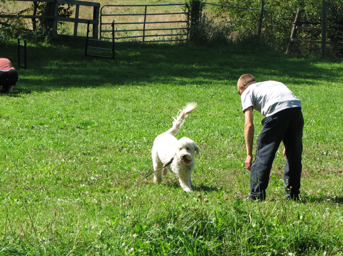 We use the dog’s basic instincts and pack socialization behaviours to help understand and communicate with our dogs. It is fast, easy and effective. At all stages, we have to help our dogs to understand the process and what we need. Let’s face it, from our perspective, when we are “training” we get to feel in control (mostly), but from the dog’s perspective he is at the other end of the transaction, learning, and may not like giving up control. Over time most dogs will want learn and they get better at it. They learn to learn. They begin to understand the process and they will enjoy the safety of knowing how to act and being a valued member of the pack. Eventually, they love being the centre of approving attention. The re-enforcement value of good behaviour becomes richer as they become a valued member of the pack with understood duties. However, short-term, the initial shaping of behavior will get mixed reviews from your dog, based on doggy temperament, your effectiveness, the type of command or the situation. Food as a positive re-enforcement can be a useful training tool for specific situations, but it is not a primary reward in our training program. Clear and consistent communication creates an environment in which your verbal praise and a good pat are sufficient reward and they are always available. The command or instructions must be clearly understood with a clear and appropriate consistent target behavior that the dog can understand over time. 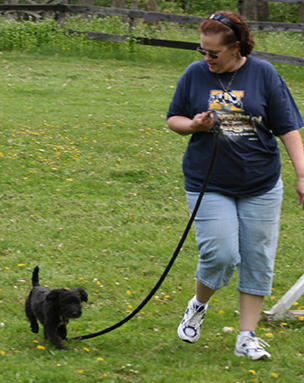 You must ensure that the dog understands the command by using cues or by shaping his movements. Often we must use several stages to shape behavior and each stage toward the goal must be clearly rewarded. For example, at each lesson a slightly better ‘Heel” is required before praise. The re-enforcement must be consistent, this proves the hardest over time. How much re-enforcement should I use? The appropriate strength of the positive/negative re-enforcement is dependent on a unique mix of many factors, including age, personality, training level and the current attitude and behavior of the moment. It also has to be effected by the dangers of the behavior. Running in front of cars and biting are both dangerous, one for the dog and one for the neighbours and both obviously call for a sterner approach. However, the basic principles to extinguish or modify behaviours are the same. 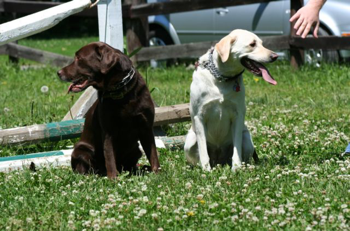 The experienced trainer can make a major difference for you both by understanding the best approach for your dog.